Now available for download from Mapping Center (zip file, 0.3MB) is an updated set of color ramps that can be used for mapping elevation, bathymetry, environmental events, and much more! These are the newest versions of color ramp styles published earlier (ColorRamps 2.0). Hypsometry – These color ramps can be used to depict elevation ranges. The colors related in a general sense to the land cover that would be found at various elevations in different parts of the world. The color ramps include symbology for both terrestrial and bathymetric data. CartoEffects – These color ramps can be used to create special cartographic effects, like the gradient border on the Crater Lake map seen on Mapping Center. Events – These color ramps can be used to symbolize continuous data that relates to environmental phenomena, including active events such as wildfires, gradual events such as desertification, seasonal event such as climate shifts, and water events related to things such as flow direction, currents, and velocity. Hillshades – These color ramps can be used for area-specific hillshades, monochromatic hillshades, or bicolor hillshade. These hillshades can be used for either land or underwater surfaces for enhanced lighting effects. 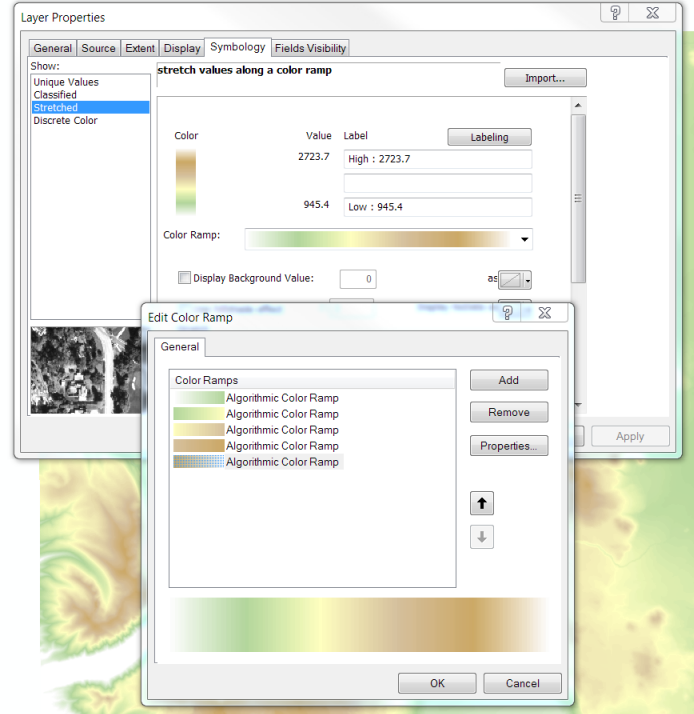 These are updated versions of the ColorRamps 2.0 styles published earlier (http://blogs.esri.com/Support/blogs/mappingcenter/archive/2008/05/13/color-ramps.aspx). 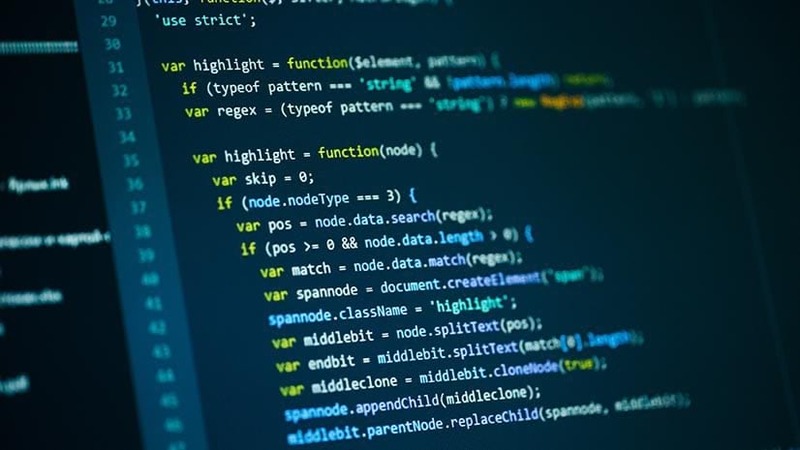 They have been edited in the following ways: redundant color ramps were removed, related color ramps were grouped together, and color ramps that were inadvertently inverted in the previous version were. ColorRamps3.0_Events.style – The order of color ramps for related environmental events and gradual events was improved. ColorRamps3.0_Hillshade and ColorRamps3.0_CartoEffects – Some of the ramps that were inverted in version 2.0 are now corrected in version 3.0. ColorRamps3.0_Hypsometry.style – We removed redundant incremental versions, and some of the ramps that were inverted in version 2.0 are now corrected in version 3.0. Your design may not require you to keep these default color assignments when you apply the color ramps. 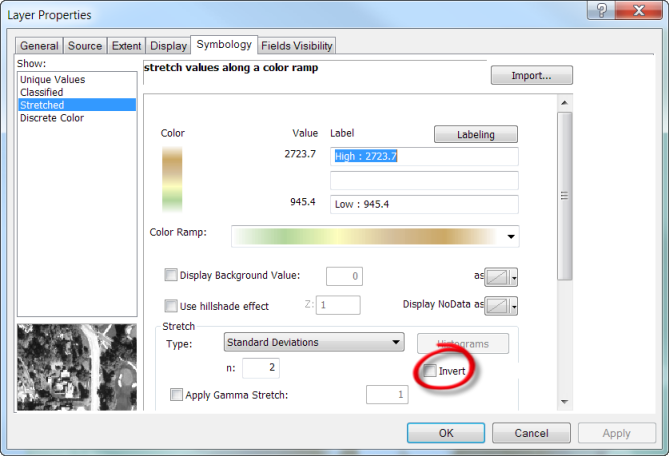 To reverse the color assignments, click the Invert option on the Symbology tab. Or you might find that you like most of the colors used in the ramp but want to modify others. To modify the ramps yourself, on the Symbology tab of the Layer Properties dialog box, right click the ramp and click Properties. Then you can edit to colors and other components of the ramp. To learn more about color ramps, read the online help topic Working with color ramps. We hope that you find lots of great uses for these color ramps. Send us a comment if you can think of enhancements or additional ramps. Thanks to Aileen Buckley, Mapping Center Lead, for her help with this blog entry!